The 2018 Haunted Swamp is on the October 13th, and 20th from 7-10 pm. Attending this event is the perfect opportunity to get ready for Halloween! 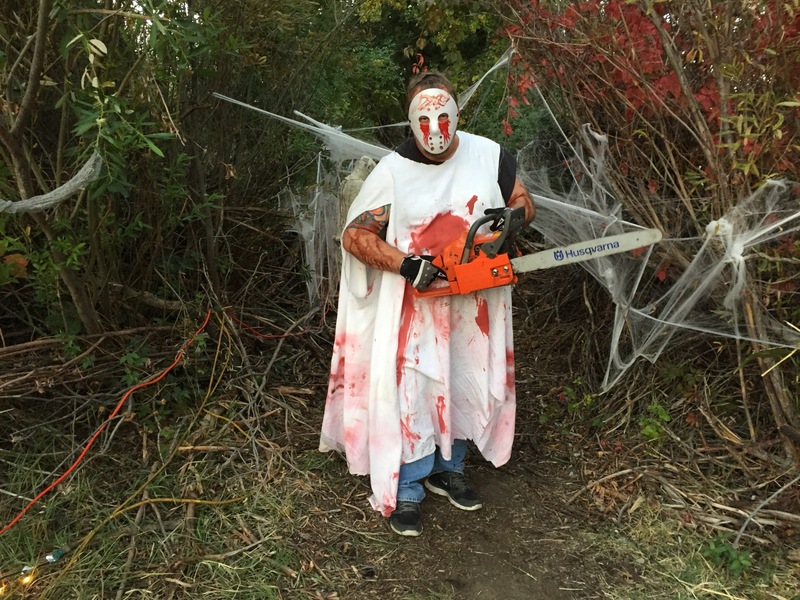 The Haunted Swamp is located at the Bishop High School Farm on Sunland Road. The event is put on annually by the Bishop Union High School Future Farmers of America. Attending the Haunted Swamp will undoubtedly lead to it’s fair share thrills and chills. More importantly though, all of the proceeds from ticket sales will go to a good cause that benefits the Bishop community. The money received from this event will go to the Bishop FFA Program, which provides aspiring farmers with a chance to grow in the farming industry. Tickets are eight dollars for adults, thirty dollars for groups of four adults, and five dollars for children under twelve years of age. Please come out to the Haunted Swamp and support your local community! Big rigs blown over on highway 395. High winds in the Owens Valley wreaked havoc Monday night for traffic on the 395. Some time early Monday evening CHP reported, not one but, TWO big rigs blown over between Lone Pine and Olancha. The accidents were caused by winds that were reported to have been up to 75 miles per hour. Drivers were caution by CHP to be extremely careful on the roads as high winds continued to be a problem in the early week. The winds were more dangerous today (Tuesday Jan, 3rd) north of Bishop. A high wind prohibition for large vehicles was issued, starting just North of Bishop and spanned all the way to the Nevada State Line near Lake Topaz. Caltrans announces the completion of project near Mono Lake. According to Florene Trainor at Caltrans, the Lee Vining Rockfall Safety Project which began two years ago was completed last week at a cost of $5.8 million dollars. The project will improve safety for the traveling public by minimizing rocks falling from steep adjacent slopes onto US Highway 395 in Mono County, North of Lee Vining near Mono Lake. The project also includes a plant establishment program on the six slopes involved to reduce erosion, establish healthy soil, and promote successful revegetation. Stage 1 construction was completed in 2015. Stage 2 construction encompassed the slopes with the installation of anchored wire mesh. Also completed within the same area is the $2.2 million dollar emergency construction project that was put in place July 12, 2016 due to the Marina Fire that which started on June 24th and burned 654 acres. The emergency project repaired guardrail and installed a temporary rockfall fence. The contractor for both projects was Papich Construction Co. Inc. from Pismo Beach California. Fire crews respond to The Wilson Fire. Fire crews are responding to the Wilson Fire. This new fire is north of Mono Lake, along the south of Highway 167 and three miles East of Highway 395. The fire is 16 acres and is 5% contained at this time. Fire crews have constructed an initial fire line around the Wilson Fire. Crews will continue to strengthen the fire line today and will work towards a complete mop-up of the fire. Responders include U.S. Forest service, BLM, Mono City Fire Department, Lee Vining Fire Department, June Lake Fire Department, Mammoth Lakes Fire Department and CalFire. Fire Managers advise travelers along Highway 167 to slow down near the fire area since crews will be working along the road corridor. The cause of the fire is under investigation but it appears to be human made. High winds and lightning pose potential problem for firefighters. Although they are not out of the woods yet the areas surrounding Lee Vining are beginning to see the light at the end of the Marina Fire tunnel. Acreage burned has remained at 654 acres since late sunday night and the fire is now 75 percent contained. However, thunderstorms in the area could produce dry lightning and outflow winds up to 50 miles per hour. This has firefighters worried because of the increased potential for new fires to flare up and spread rapidly. As the containment line continues to increase unnecessary firefighting resources will be released accordingly. This demobilization process will allow equipment and personnel to return to their home units or reassigned to other fires. The investigation to determine the exact cause and origin of the fire is ongoing. Crews will be pile burning in two locations today. Firefighters hope to complete 17 acres of piles near the Double Eagle Resort in June Lake today. Crews will also be burning near the Sherwin Creek Road and Sherwin Creek Campground in Mammoth Lakes in the next few days, where there are at total of 194 acres of piles. In addition to taking advantage of the recent snow to safely complete the much needed fuel reduction, the crews are also using the favorable forecast for good smoke dispersal. Expect to see smoke near both towns and from Hwy 395. Cover Photo, Inyo National Forest file photo. Fire crews plan to continue with pile burning today (Monday, January 11th) with a target of 30 acres. 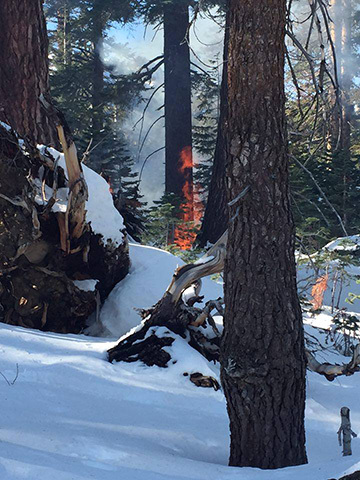 The piles are south of Smokey Bear Flat and immediately adjacent to the east side of Highway 395. Smoke will be visible to motorists along the highway in the area. Crews are taking advantage of the recent snow to tackle fuel reduction projects that they haven’t been able to safely burn during the previous drought years. Beginning Sunday, October 18, 2015, the Visitor Center at Manzanar National Historic Site will open at 10 a.m. and close at 4:30 p.m. People arriving between 9 and 10 a.m. can visit the exhibits in Block 14’s barracks and mess hall, as well as drive or walk the square-mile site to see Japanese rock gardens and other features. A restroom is available at the historic Manzanar cemetery on the west side of the site. As always, the site itself is open from dawn to dusk. In prior years, Manzanar went to winter hours of 9:00 a.m. to 4:30 p.m. beginning Nov. 1. Current staffing levels have necessitated shorter hours for the Visitor Center, but visitors still have the opportunity to learn about the personal experiences of individuals, families, and communities incarcerated at Manzanar in the nearby barracks. Those exhibits feature extensive photos, documents, and quotes illustrating the challenges and changes people faced at Manzanar. 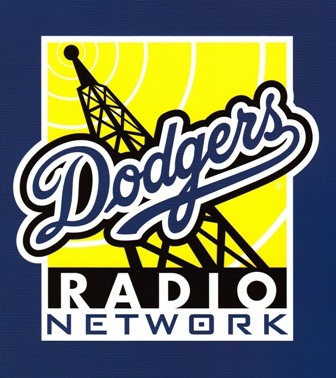 Six audio stations and one video station feature a total of 42 oral history clips. Exhibits in barracks 1 focus on the early days of Manzanar, when thousands of people arrived to an unfinished camp. Barracks 1 also includes a Block Manager’s office, featuring the papers of Block Manager Chokichi Nakano. Barracks 8 features an “improved” apartment with linoleum and wall board. A second room explores the Loyalty Questionnaire and its profound long-lasting impacts. Manzanar National Historic Site is located at 5001 Hwy. 395, six miles south of Independence, California. Admission is free. For further information, please call (760) 878-2194 ext. 3310, visit our website at www.nps.gov/manz, or explore their page at www.facebook.com/ManzanarNationalHistoricSite.